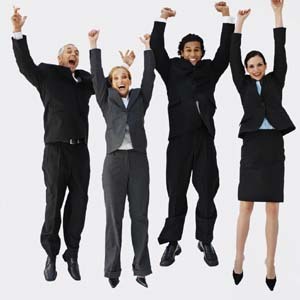 So…when was the last time you launched a training program that made people jump up and down? Yeah…that’s what I thought. The truth is, Alternate reality games can incorporate many of the elements that traditional training lacks: social learning, experiential learning, game play, and competition. And…brace yourself…fun. So what is an Alternate reality game? And how can you use them to help people learn? Alternate reality games (ARGs), also sometimes called pervasive games, are designed to combine real life and digital game play elements. Typically, ARGs are “tracked” online but the actual game play consists of real life activities. There are many entertainment-based examples (eg, I love bees, The Lost Experience, Numb3rs Chain Factor) and emerging examples of ARGs for serious purposes (eg, Urgent Evoke, World without Oil). A new area of focus is how ARGs can be leveraged for corporate training or medical purposes. I’ve seen a lot of confusion in the term ARG–some people use “alternate reality games” and “augmented reality games” interchangeably. For a point of clarification, alternate reality games refer to game play that integrates real life and online game play; augmented reality games refer to games where there is a technology overlay on reality that contributes to play (think the 1st down line on televised football games). It’s difficult to make generalizations of what an ARG is or looks like for learning. Just as there are an unlimited number of games and rules for game play, the same is true for ARGs. Designs could range from something very simple (eg, a scavenger hunt) to something very complex (eg, large scale, problem-based learning leadership development). There are, however, some basic design principles and “lessons learned” that have become apparent as we have designed more and more ARGs for corporate learning. Design is the key: just as with any game, ARGs are most successful when they are designed for the type of play and outcomes that both make them fun and engaging as well as focused on achieving the desired goals. This is not instructional design; this is game design with learning goals. A huge misconception is that because you’ve played games, you know how to design them. Don’t underestimate the amount of time, energy, thought, and expertise that it takes to design a fun game, let alone a fun game that accomplishes your organizational learning goals. Technology drives the experience: you shouldn’t underestimate the importance of the game design, but neither should you underestimate the importance of having a solid technology plan for driving and tracking the game play. Much of the basis of a good game is the mechanics–you can’t play Yahtzee without dice or poker without cards. Technology enables game play and is an essential element of what makes an ARG successful. What’s your story? : everyone loves a good story. The most successful ARGs embrace storytelling as a key element of the game play. For corporate training initiatives, the storytelling elements can either mirror real-life scenarios or be more of a fantastical overlay. Strategy for the storyline should align with the design and objectives, but should not be overlooked as a critical aspect of the experience. Stick to the point: yes, it might be fun to plan an ARG with a Mission Impossible theme, but it might not be appropriate for a game focused on team building. Make sure that your design is led by and focused on your learning objectives. Recognize that anything that doesn’t support your goals might distract from them and be strategic about what you focus on to reduce cognitive overhead. Play to learn not learn to play: beware of designing game play rules that are so complex that there’s a significant learning curve to figure out how to play the game. Unless, of course, the goal of the game is to promote critical thinking skills…then it might be appropriate 🙂 But in general, ARGs should be designed with clear rules of play to help players focus on the content and accomplishing the learning goals instead of figuring out how to play or win the game. Should you keep it on the down-low? : in the past, part of the intrigue and appeal of ARGs is that they have been secret or subversive, which created an atmosphere of being “in the know.” But for learning, you probably don’t want your training experiences to be secret, but it might not be a bad idea to think about how you can still create that feeling of subversiveness. Secret clues, bonuses, and secret codes are all examples of ways that you can create a “secret” feel to game play. Corporate training initiatives and live events and conferences are great opportunities to leverage the strengths of ARGs at a comparatively low cost. How would you rather learn and network with your peers? What kind of shared experiences could an ARG provide as a basis for learning and relationship building? The possibilities and opportunities are endless. Koreen Olbrish, Ayogo VP of Learning Design, founded Tandem Learning (a division of Ayogo) to demonstrate the untapped potential of immersive learning design. Applying her background in experiential learning and technology for education, Olbrish advocates new ways of leveraging technology for enterprise learning with emphasis on performance improvement and behavioral change. She has strong ties to education, having received her M.S. in curriculum and instruction from Penn State University and helping start Freire Charter School in Philadelphia in 1999. Her recent experience has been in the development of enterprise learning solutions, with particular expertise in simulations, games and the application of virtual worlds for learning.